4-H Adventure Education & Challenge Programs foster team development, leadership and personal growth within a caring, group setting. 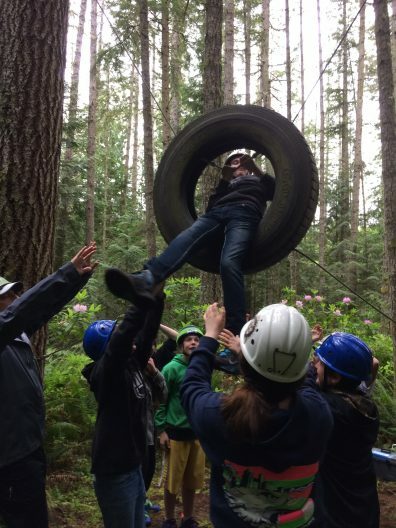 Using a series of fun and engaging outdoor learning activities, participants strengthen relationships, improve communication, and develop their leadership skills and abilities. 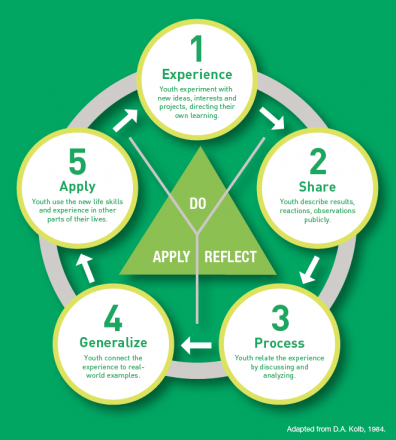 Our programs help youth to grow into capable, caring, and contributing citizens through research-based experiential-learning models (please see the “Do-Reflect-Apply” model below). “Challenge By Choice”: Participants are encouraged to take risks in Challenge programs, such as trying a new behavior or an unfamiliar activity. With the support of the group, these perceived challenges can be successfully overcome. However, it is ultimately the participant who decides their level of involvement. Portable Challenge Experience is designed for groups and teams to build communication, trust and social/emotional learning skills in a classroom or outdoor setting. The activities range from 1-4 hours long, sometimes through multiple sessions. For more information about WSU 4-H’s Adventure Education programs and resources, please click this link http://extension.wsu.edu/4h/youth/4-h-adventure-education/.